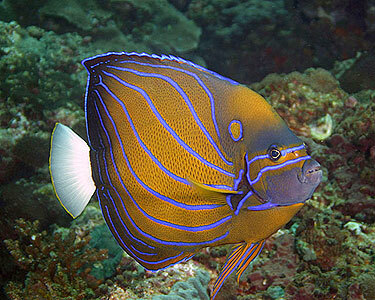 Facts about Annularis Angelfish, "Scientific name for Annularis Angelfish is Pomacanthus annularis". The Annularis Angelfish, also called the blue king angelfish and blue ring angelfish. The Annularis Angelfish is so named because of its bright blue rings on a mostly brown, black and sometimes orange tinted body. The young Annularis Angelfish are initially dark blue or black with brilliant blow and white vertical stripes, though those stripes will darken with age to a deep blue or violet. Annularis Angelfish is a member of the Pomacanthus genus. The Annularis Angelfish can grow up to 12 inches (30.5 cm)in length. Because of their size, the Annularis Angelfish can only be kept in tanks of at least 220 gallons (832 liters). The Annularis Angelfish species is wide ranging across the Indo-Pacific Ocean, from East Africa to the oceans on the northern Australian coast to Japan. Wild-caught blue ring angelfish will rip up a reef in your fish tank. Even domestically raised blue king angelfish will pick at soft coral. The fact is that a Annularis Angelfish are omnivorous, (definition-they eat both other animals and plants). The Annularis Angelfish eat zoa corals and they will pick at leather coral. The Annularis Angelfish may eat hard coral and they will eat nudibranches and nip at three footed clams and they will also graze on algae. When first get your, Annularis Angelfish it may need to be given live foods such as freshly chopped seafoods or brine shrimp or to encourage them to eat. Use caution when putting the annularis angelfish in a tank with smaller angelfish, since this could evoke territorial and predatory behavior. Angels are territorial with each other, but the annularis is known to sometimes eat smaller fish. You can feed your Annularis Angelfish vegetables like algae flakes, meats like mysis and brine shrimp and food preparations containing spongiform products. The Annularis Angelfish Ideal water temperature is between 72 to78º F (22-25.5º Cel) and pH from 8.1 to 8.4. The specific gravity at 1.020 to 1.025. The Annularis Angelfish is hermaphroditic, so you cannot tell if a specimen is male or female based on size. The Annularis Angelfish should be acclimated to the tank over time, instead of simply dumped in. Keep a wild-caught specimen in quarantine before adding to the tank. You may need to entice it to eat with live foods like brine shrimp to get it to eat. Test the water when preparing your tank for your fish: You will need to purchase a liquid tester so that you can test for Nitrates and Ammonia. The strip-style test kits are unreliable and a waste of money. You should use a dechlorinating product to remove the harmful chlorine from the water. Test for nitrite, ammonia, and proper PH. The ammonia should always be 0, the nitrite should be 0, and the nitrate should preferably be below 10 ppm. If it's at or above 20 ppm, you have too many fish or are not changing the water often enough. Cycling your tank is important, Follow the steps to cycle your tank. This establishes healthy bacterial and chemical levels. When buying your Annularis Angelfish see which one looks like the healthier fish. Be wary of tanks with dead fish in them, as this can be a sign of illness or improper care. Clamped fins are a sign of illness. In addition, healthy Annularis Angelfish will have no white spots, make sure they swim with their fins held upright, and have a nice rich color or colors. Make sure they swim all over the tank and look healthy. When adding the Annularis Angelfish to the aquarium, it is important to introduce the Annularis Angelfish to the tank environment slowly. As soon as you get home, float the entire, closed pet store bag (with the Annularis Angelfish inside!) in the tank on top of the water for about a half hour. This will allow the water in the plastic bag and the Annularis Angelfish to equalize out to the same temperature as in your tank, so your fish does not get shocked by the different temperature. Next, add a small amount of water from your tank to the bag, and wait about 15 minutes. Do this at least one more time. Us a net to catch your Annularis Angelfish and then while the Annularis Angelfish is in the net, dispose of all the water down a drain or outside. Then transfer the fish carefully into the your tank. This process not only reduces stress for you fish, it also prevents the dirty pet store water from contaminating your tank with disease. Remove 30% of the water from your Annularis Angelfish fish tank each month with new water, or a 15% water change every 2 weeks is ideal for keeping nitrates lower. With corals in the fish tank, then 20% water change every month, or 10% change every 2 weeks.